Join one of aqua group fitness classes called the “Wave”. Classes are offered year round. All levels and ages (over 14yrs.) are welcome. Click here for class schedule. 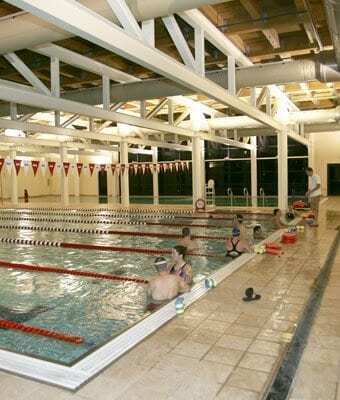 Classes last approximately 58 minutes and are held in the small indoor pool and sometimes in the outdoor pool and lazy river. Classes are designed for all levels of fitness. The workout consists of some shallow water exercises and resistance training, as well as some deep water training. Buoys and other props are included to vary intensity. No sign-up necessary. There is no charge for this class. See you in the pool. This class is divided into 2 groups, beginners and advanced. It is offered monthly and meets twice a week. Fees are based on $8 per day and range from $64-$72 per month with a monthly commitment. The class includes coaching, endurance training and plenty of camaraderie. This class is for the child who has a passion for swimming and wants to join a swim team, do triathlons, get in better shape, or just because they want to get more experience on how to swim. The class will consist of 30 minutes of swimming. They can learn up to all four strokes throughout the month depending on the swimmer’s level. They will learn how to do a flip turn, use a kick board, and learn to do drills to continue improving their swim technique. 15 minutes of each class will be dedicated to strength training in the water. Classes are scheduled twice a week. 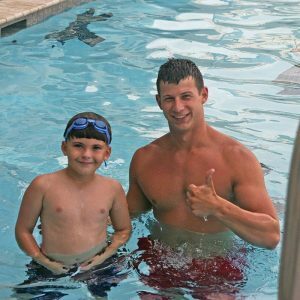 We offer private swim lessons all year for ages 3 and up. Half hour lessons are recommended for children age 3 – 10 years of age. The cost for lessons is $20 per half hour and $40 per hour for members. Non-members may take lessons as well. Non-members may take a maximum of 5 lessons per year and the rate is $30 per half hour. A Water Babies class is recommended for children 6 months to 3 years of age. This is a group class. It is a parent/tot class where instructors will go over ways to hold your child in the water and how to get your child ready to start swim lessons. Watch the newsletter for dates and times of upcoming classes. To register, stop by the Front Desk and sign up. We will have an instructor call you to set up dates and times for the lessons. Lifeguard certification classes are available at Red’s. Click HERE for the registration form for 2019 classes. Please have someone call me to discuss signing up for swimming lessons. If Child, list age here.